Santrauka: The bestseller with more words, phrases, and examples than any other dictionary at this level. 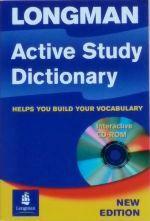 For students who want to improve their English and build their vocabulary, the Longman Active Study Dictionary has more words, phrases and examples than any other dictionary at this level. Features of the dictionary include: • An easy-to-use format - including thesaurus boxes, collocations, Active Words with key information, and clear definitions - that provides students with everything they need to develop their language skills. • Appealing colour photos and pages that help students understand meanings more easily and make words more memorable. • A 24-page Longman Learner’s Handbook that provides further information on subjects such as vocabulary building, collocations, phrasal verbs and writing.